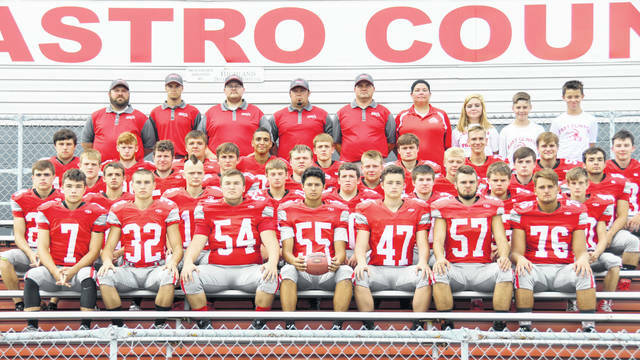 The East Clinton High School football team, from left to right, front row, Austin Rolfe, Cameron Yankey, Logan McPherson, Austin Arellano, Seth Garrison, Daulton Wilson, Robert Norman; second row, Todd Wedding, Taylor McComas, Brad Fast, Clayton Hansford, Nathan Vest, Brody Fisher, Kane Moreton, Aiden Morgan; middle row, Jared Smith, Cameron Vadnais, Kaleb Kingery, Jayson Edison, Mitchell Bean, Michael Horn, Mason Huff, Garrett Elzey; fourth row, Gunner Neanover, Patrick Dotson, Chris Norman, Jaden Singleton, Branson Smith, Cade Stewart, Landon Runyon, Garrett Kier, Tristan Burkitt; back row, assistant coaches Mark Scovanner, Clyde Snow, Steve Olds, Daniel Day, head coach Jeremy Yankey, trainer Kari Terrell, student managers Josie Runk, Lucas Runk, Kasen Terrell. East Clinton has three starters it will need to replace from last season’s 3-7 squad. But they were three key elements to the Astros’ success, limited as it was. Nick Mess, the team’s top lineman; Wyatt Floyd, the best all-around player on Friday nights; and Brendan Jenkins, the dual-threat offensive cog, have graduated and taken their first-team All-SBAAC National Division plaques with them. Jenkins rushed for 671 yards and seven touchdowns while passing for 723 yards and six scores. Floyd caught 45 passes for 490 yards and two touchdowns. Mess had 52 tackles on defense. Fourth-year head coach Jeremy Yankey is confident he has the players who can fill those voids. He likes “the leadership that we are developing in our locker room,” the coach said. In fact, last season, many of the then-sophomores and juniors were vocal leaders who have continued that attribute into the 2018 campaign. Yankey’s coaching staff at the varsity level includes Mark Scovanner, Steve Olds, Clyde Snow and Daniel Day. The middle school coaches are DJ Henry, Jim Vest, Jayden Luttrell and Cameron Conner. There are seven starters returning on both sides of the ball, but only 11 letterwinners total so many starters are going both ways. Yankey likes the makeup of his squad with eight seniors and nine juniors on the roster. He also likes the fact that 13 freshman are listed. But only three sophomores are playing this season and that’s a problem, if not this year then certainly in the future. One of those sophomores, Kaleb Kingery (5-10, 164), was second team All-SBAAC National along with junior Patrick Dotson (6-1, 169) and senior Tristan Burkitt (5-9, 152). Seniors Austin Rolfe (5-8, 150) and Austin Arellano (5-11, 186) were both given honorable mention all-league. Arellano and Dotson were honorable mention All-Southwest District players. Yankey said his team must improve its tackling and mental toughness if it is to avoid an 0-3 league finish like it had last season. One of those losses was the National Division champion Bethel-Tate, who Yankey said was once again the league favorite. East Clinton started the season 1-4 then won two straight National Division games in its bid for a league championship. However, disappointing losses to Bethel-Tate, Clermont Northeastern and Blanchester ended the Astros season on a downhill slide.